Cardiovascular disease, diabetes and cancer have a dramatic impact on modern society, and in great part are related to uptake of cholesterol and sugar. We still know surprisingly little about the molecular details of the processes that goes on in this essential part of human basic metabolism. An improved understanding of cholesterol and sugar homeostasis has tremendous potential for improving general public health, and in our lab we aim to uncover general principles of endocytotic uptake and facilitated diffusion systems at the molecular level. We do this using a complementary set of methods founded in macromolecular crystallography and electron microscopy to determine the 3-dimensional structures of key players in these uptake systems. This is then followed by biochemical characterization of the molecular mechanism in vitro and in silico. Sterols are an integral component of membranes in eukaryotes, vital for membrane fluidity and integrity. Cholesterol, the most abundant sterol in animals, also functions as a signaling molecule and as a precursor for bile acids, vitamin D and steroid hormones. The membrane protein Niemann-Pick C1-Like 1 (NPC1L1) mediates cholesterol uptake into the enterocyte from the small intestine. 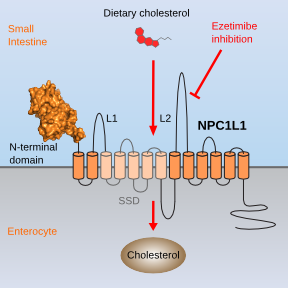 NPC1L1 is essential for intestinal cholesterol absorption and is the target of ezetimibe, a potent and specific cholesterol uptake inhibitor. The molecular mechanism of NPC1L1-dependent cholesterol uptake is still almost completely unknown. The current tentative hypothesis is that NPC1L1 likely functions as a receptor rather than a transporter, as NPC1L1 cycles between the endocytic recycling compartment and the apical membrane in a cholesterol-dependent manner. Almost nothing is known about the molecular interactions of NPC1L1 with substrates and interaction partners, including whether NPC1L1 mediate any kind of active transport across the membrane. This question lies at the core of understanding how NPC1L1 confer its essential biological function in vivo. NPC1L1 and the NPC1-family presents a highly valuable group of targets to address a range of important human maladies, as well as to improve fundamental understanding of essential cholesterol and vitamin uptake pathways for which the molecular mechanism remains almost completely unknown. 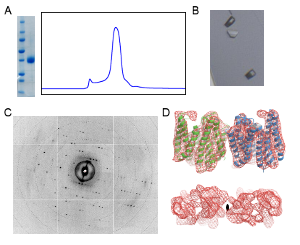 The long-term objective of the lab is to elucidate the molecular mechanisms underlying NPC1L1-dependent cholesterol transport by a combination of crystallography and electron microscopy. 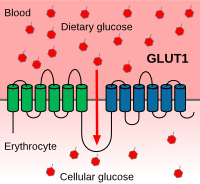 Sugars are the major cellular source of energy and carbon, and facilitated sugar transport in humans is made possible by sugar transporters called GLUTs and SWEETs. The GLUTs are absolutely essential for basic energy levels in the cell, but are also of particular interest due to their relevance to various diseases, most prominently diabetes, obesity and cancer. SWEETs are a newly discovered family. Almost nothing is known about how they function, including their molecular mechanism of sugar transport. The long-term objective of the lab is to understand the molecular mechanism of energy-independent transport of sugar in humans by determining the structure of proteins in the GLUT and SWEET families, and use this information to guide studies of mechanism.